What are master resale rights? When will I get access to iProfit eBook Package after I place my order? Your payment details are verified instantly, and you will have access to the iProfit eBook Package within a few seconds after your order is placed. Are my payment details secure when I order from your site? Yes. All payment transactions on our site are handled by ClickBank, a third party payment processing company. Clickbank is one of the biggest payment processors on the internet and has the highest security standards. Can I get a refund if I’m not satisfied with my purchase? Yes. If you are not satisfied with your purchase, you can request a refund within 8 weeks from the date the order was placed. Your money will be refunded to you in full. Please note that after 8 weeks all sales are final. Can you guarantee that I will make money by selling the products and using the techniques provided by iProfit eBook Package? What format do the ebooks come in? The ebooks are either in .exe or .pdf format. To read .pdf files you will need to install Adobe Acrobat Reader on your computer if you don't already have it. It can be downloaded for free on the Adobe website. How long will it take to download the iProfit eBook Package and it’s contents? The iProfit eBook Package is about 1mb in size and will take about 3-4 minutes to download on a 56k modem. From within the main package you will be able to download all other products individually, any time you wish. Download times vary but are usually around 2-3 minutes per product on a 56k modem. If I buy now, will I have to pay again when a new version of iProfit eBook Package is released? No. iProfit eBook Package comes with Free Updates. Every time a new version is released, it will be made available to you free of charge. What are the system requirements for the iProfit eBook Package software? iProfit eBook Package requires Windows 95, 98, NT, Me, 2000 or XP and Internet Explorer 5.0 or higher. The latest version of Internet Explorer can be downloaded for free on the Microsoft website. Hardware requirements are very low. If your computer can run windows, then it will run iProfit eBook Package and all the titles contained in it. Please note that the software is not compatible with Mac or Linux. Do I need to be connected to the internet when I am reading the ebooks? Do I have to follow any rules when I sell the iProfit eBook Package? Yes. Some rules/guidelines have to be followed when selling the iProfit eBook Package. Visit the ‘Terms of Resale’ page for more information. Can the individual products contained inside the iProfit eBook Package be included in other packages, or membership sites? Yes, all the individual products contained within the package can be included in other packages and membership sites. Can I sell the individual products contained inside the iProfit eBook Package for as much as I want? Yes, you can charge as much as you want when selling the individual titles contained within the iProfit eBook Package. Can I create my own Package by using the individual products contained within the iProfit eBook Package? Do all the individual products contained in the iProfit eBook Package come with ready-made sales websites? Yes. All the individual products come with professionally designed sales websites. Will I need to make any changes to the sales pages before I will be able to use them? Do I have to host the iProfit eBook Package files on my own server? 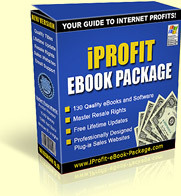 If you sell the entire iProfit eBook Package as it is, we will host all the files for you. We will host the main file, as well as all the individual downloads contained in iProfit eBook Package on our server. However, if decide to sell the products contained in iProfit eBook Package individually, then you will have to host them on your own server. If you are looking for a host we recommend iPowerWeb hosting. Do I need a website in order to sell the iProfit eBook Package and the other products contained in it? No. A website in not necessary. There are various other ways to sell the iProfit eBook Package and the other products contained in it. However a website is the best way to promote such products. All the titles come with professionally designed sales websites. All you have to do it upload them to your host. How can I accept credit cards on my website in order to sell these products? You can accept credit cards on your website easily, by joining a credit card processing company. They will accept credit cards on your behalf, and mail you a check every month (or sooner), after they deduct a small fee for their services. Clickbank.com is one of the most popular online credit card processing companies. How can I increase my website traffic and make more sales? There are many ways to increase your website traffic and make more sales. There are many products inside the iProfit eBook Package that cover this subject in detail.